The Emil Gursch typefoundry’s 1901–1918 building — Blog — TypeOff. The image above is a rendering of the Emil Gursch typefoundry’s factory building at Gneisenaustraße 27 in Berlin, as it would have appeared in 1917. Reproduced from Das Haus Berthold, p. 77. Friedrich Bauer: Chronik der Schriftgießereien in Deutschland und den deutschsprachigen Nachbarländern. Verlag des Vereins Deutscher Schriftgießereien, Offenbach am Main 1928. Berliner Adreßbuch 1943. Verlag August Scherl Nachfolger, Berlin 1943. H. Berthold AG (ed. ): Wie werden Druckbuchstaben hergestellt? Promotional Film. H. Berthold AG, Berlin 1937. Schriftgießerei Emil Gursch (ed. ): Die Entwicklung der Schriftgiesserei Emil Gursch, Berlin SW. 1866–1901. Schriftgießerei Emil Gursch, Berlin (undated, c.1901). Heinrich Hoffmann: Das Haus Berthold 1851–1921. Zum 25jährigen Bestehen der Aktiengesellschaft. H. Berthold AG, Berlin 1921. Die Entwicklung der Schriftgiesserei Emil Gursch contains 22 photographs of the exterior and interior of Gursch’s Gneisenaustraße 27 factory building, including all of the firm’s equipment (but not any of the employees; no workers are to be seen in any of the photographs). Currently, I am only aware of three copies of this brochure. Two are in Berlin: one is held by the Deutsches Technikmuseum, and the other in the Kunstbibliothek. Since I have not ordered photographs of the brochure’s pages (and purchased reproduction rights from either institution), those historical images are not part of this post. A third copy was photographed by Jens Jørgen Hansen, who uploaded all twelve of the brochure’s pages to his Flickr stream. You can see them here: , , , , , , , , , , , . His images’ rights aren’t set to allow for others to use them – but they are pretty big, in terms of their pixel dimensions. Do go and have a look! In a notice published on 1 March 1866, Hermann Engel, Emil Gursch and A. Hoffmann announced the establishment of the “E. Gursch & Co.” typefoundry. The new foundry’s first location was at Sebastianstraße 76 in Berlin, just to the north of Oranienstraße, in what is today part of Kreuzberg. Hoffmann did not remain part of the business for very long. The foundry’s c.1901 company history, Die Entwicklung der Schriftgiesserei Emil Gursch, only provided details for the personal backgrounds of the other two co-founders. It reported that Engel and Gursch had each learned typefounding while working in the printing house of Rudolf Ludwig Decker. Decker’s establishment was a purveyor to the Royal Prussian Court, and it included an in-house typefoundry. In 1867, E. Gursch & Co. was able to expand the number of fonts it had on offer by acquiring Heinrich Ehlert’s typefoundry. Ehlert was a punchcutter by trade; before he had established his own foundry, he had worked for the in-house typefoundry at Eduard Haenel’s printing house. In 1873, E. Gursch & Co. moved to Stallschreiber Straße 4 – just about around the corner from Sebastianstraße. By that time, the company employed eight workers, and it operated five typecasting machines. Four years later, the foundry moved to its third location in the same neighborhood: this time to at Prinzenstraße 12. By acquiring the Collin typefoundry, E. Gursch & Co. was able to increase its total number of typecasting machines to eleven. After 1881, the typefoundry was co-owned by Emil Gursch and the businessman Carl Graumann; the firm’s name was changed to at that time to “Schriftgießerei Emil Gursch.” Emil Gursch himself retired in 1886. The typefoundry continued to move further south: in 1891, they went to Ritterstraße 90, into a space that was 1,100 square meters in size. From 1891 until 1898, Wilhelm Reschke was a co-owner of the firm; after he left, Graumann was once again the sole owner. Around the turn of the century, the typefoundry purchased a plot of land at Gneisenaustraße 27, where they had a 2,000 square meter factory built for them. They moved into it in 1901, and that is the building today’s post is dedicated to. Gursch’s Gneisenaustraße 27 factory building was located only about 500 meters to the east of H. Berthold AG’s main facility. The hundreds of workers that were employed in total between the two companies must have seen each other socially – if not at common events organized by the printers’ and typefounders’ union, then perhaps at various neighborhood pubs in the evening. The two firms did business with each other, too (at least on occasion): for example, Gursch began manufacturing pantographic punchcutting and matrix-engraving machines in 1905, and in 1910, Berthold purchased its very first pantographic punchcutting and matrix-engraving machines from them. Although some American typefoundries had begun using pantographic machines for type-making by the 1880s at the latest, their adoption in German typefounding was not immediate. Even within the German typefoundry landscape – which included dozens of punchcutting and/or typefounding firms – their adoption was staggered from company to company. Until 1910, Berthold’s punches and patrices were all still cut by hand [see Das Haus Berthold, p. 59]. Most of Berthold’s matrices were probably electrotyped, rather than struck; Hermann Berthold had founded the company in 1858 as an Institut für Galvano-Typie, after all. As is visible in Wie werden Druckbuchstaben hergestellt?, a 1937 Berthold promotional film, the matrices for many of Berthold’s typefaces were then still being created via electrotyping, instead of with matrix-engraving machines (the master patrices shown in that film were engraved pantographically, however). Karl Graumann had been the sole Gursch owner since 1898. In 1913, his son Erwin became a co-owner of the foundry. In 1917, Gursch and Berthold bought the Otto Tech typefoundry, which they dismantled and split between them. In 1918, Berthold then acquired the Gursch typefoundry outright. According to Friedrich Bauer’s Chronik der Schriftgießereien in Deutschland und den deutschsprachigen Nachbarländern, Berthold thereafter incorporated several Gursch typefaces into its product range. After taking the Gursch foundry over, Berthold did not shutter the operation. Instead, they kept the factory at Gneisenaustraße 27 running, making use of its machines’ capacity, and probably keeping its customer base, too. In 1917, just before the acquisition, Gursch had employed more than 200 individuals, and had operated dozens of typecasting machines. The factory likely only ceased operations toward the end of the Second World War; H. Berthold AG is still listed as being one of the Gneisenaustraße 27 occupants in the 1943 Berlin address book [see Berliner Adreßbuch 1943, part IV, p. 286]. In an 11 March 2019 lecture on Dr. Oscar Jolles at the Schule für Erwachsenenbildung in the Mehringhof – Berthold’s factory building from 1869 through 1978 – Hermann Werle mentioned that the Bertholddrucke, Berthold’s bibliophile publications from the 1920s and early 1930s, were printed inside of the former Gursch building at Gneisenaustraße 27. This is also recounted in a small book about Jolles published by the school [see Oscar Jolles, p. 12 and 19]. My copy of Gustav Mori’s Das Schriftgießereigewerbe in Süddeutschland und den angrenzenden Ländern, the second of 22 Bertholddrucke printed between 1923 and 1932, has a small card inside of it stating that it was from »Die H. Berthold AG Abt. Privatdrucke« at Gneisenaustraße 27. The façade of the old Gursch typefoundry factory building, in the interior courtyard of Gneisenaustraße 27, photographed in 2018. Much of what I wrote in my previous post about the geography of Berthold’s 1869–1978 headquarters also applies to this Gursch factory location. In 1901, when Gursch moved into their purpose-built factory building, Gneisenaustraße was located in the then-southwestern part of Berlin that was known as the Tempelhofer Vorstadt. The area had been incorporated into the city of Berlin in 1861. Since 1920, the area of the city encompassing the Tempelhofer Vorstadt has been known as Kreuzberg. 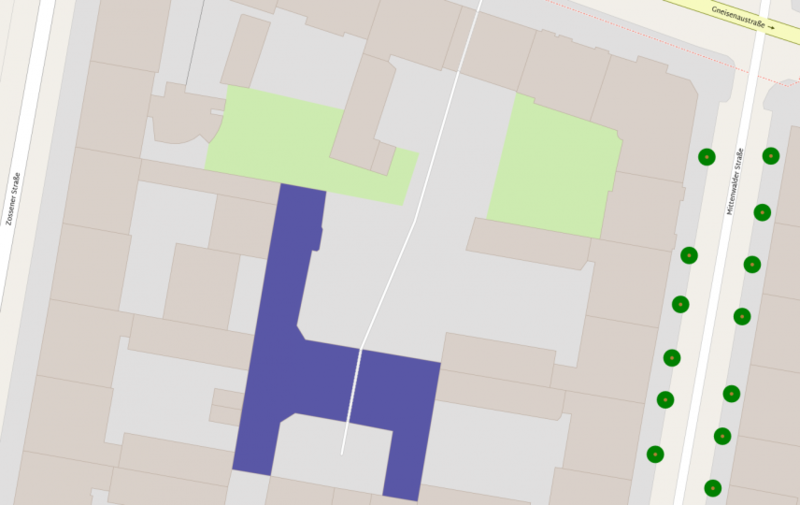 On the above areal plan, I have highlighted the former Gursch foundry factory building in purple. The map also shows the pathway that leads through the street-facing structure at Gneisenaustraße 27 into the old factory building. © OpenStreetMap contributors. The former Gursch factory is not visible from the street. It is behind a newer building that also has the address Gneisenaustraße 27. 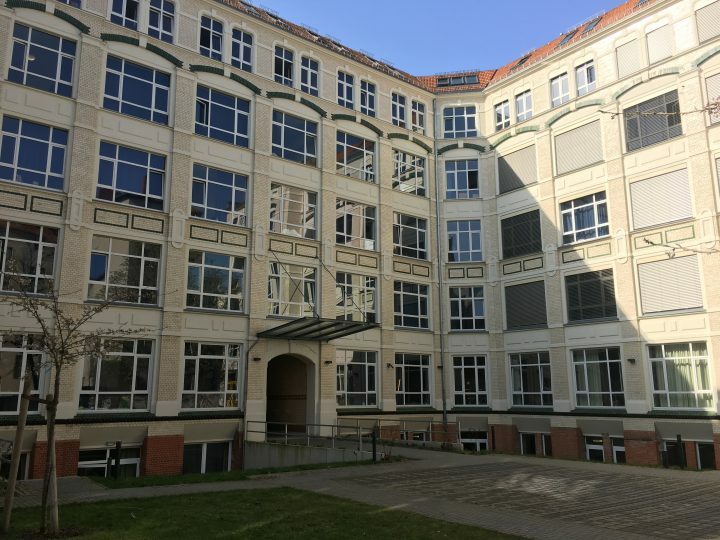 The whole Gneisenaustraße 27 complex – the newer street-facing building and this former factory building alike – now houses American study abroad students. The ground floor of the former Gursch factory contains a large café operated by Cuccuma, whose main location is nearby in the Zossener Straße. Although Gneisenaustraße is about a twenty-minute U-Bahn ride from my apartment, this café-inside-a-former-typefoundry-factory is currently the place I choose for scheduling all of my meetings. 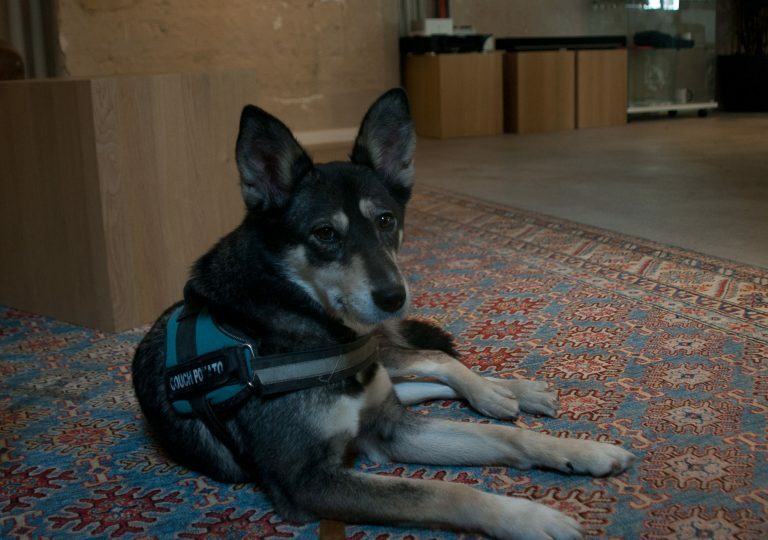 Astonishingly, this is the first photo of Laika that I have publihsed on TypeOff.de. She is pictured here in of the café located inside of the former Gursch typefoundry factory building, waiting for a meeting to end.